Genea-Musings: Amanuensis Monday - 1736 Bonds for Estate of Josiah Wood (1687-1753) of Woburn, Mass. 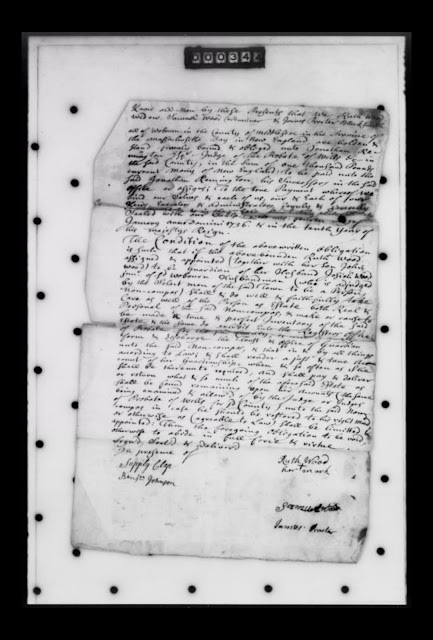 Amanuensis Monday - 1736 Bonds for Estate of Josiah Wood (1687-1753) of Woburn, Mass. of Probate for the said County, or ???? ?? ????? otherwise to abide in full force & virtue. void, otherwise to remain in full force & virtue. After receiving the petition, the Judge of Probate wrote to the selectmen of the town of Woburn asking their judgement and they responded saying they agreed that Josiah Wood was incapable of caring for his family or his affairs. The Judge then declared Josiah's wife, Ruth, and their eldest son, John Wood, to be Guardians for Josiah wood Junior (his father Josiah Wood was still alive then). The Judge requested that the guardians prepare an inventory of the real and personal estate of Josiah Wood. The two documents above are nearly identical - they are bonds that commit Ruth Wood and John Wood, as Guardians, to well and truly do their duty as guardians, and, with two friends, post bond of 1,000 pounds each. 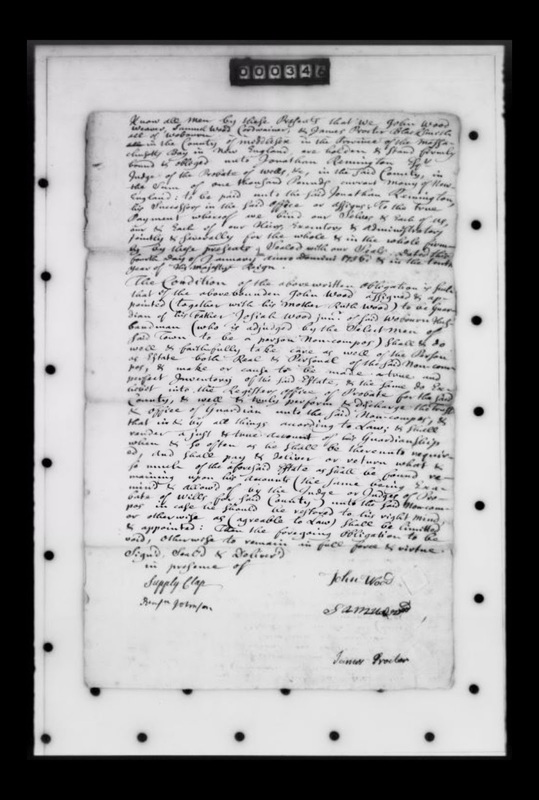 Josiah and Ruth (Walker) Wood are my 7th great-grandparents, the parents of Susanna Wood (1724-1780), who married Nathan Reed (1719-1802) in 1743.